Sleeping Beauties – Is there a Future for University Collections? 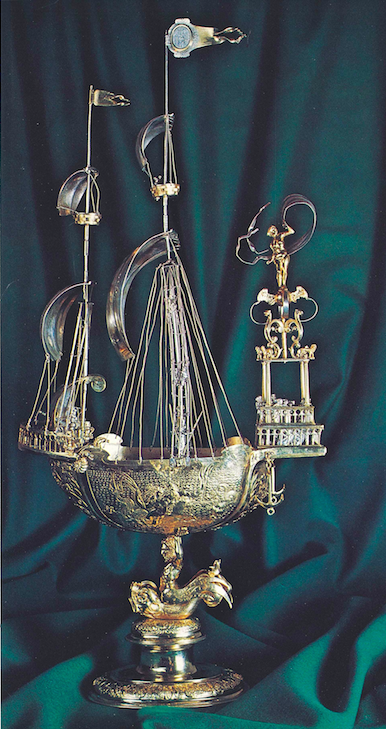 Imagine a present-day student being so happy with the education she or he received from the alma mater that the thank you note includes a huge drinking vessel in the form of a ship and made from gilded silver. Perhaps a little over-the-top but then those were different times and the donor, Ferdinand II Habsburg, educated at the University of Ingolstadt between 1590 and 1595, was not your average student. True enough, even today alumni occasionally make prestigious and valuable gifts – though rarely with such style and panache. Traditionally, universities have been among the most active collectors. Educational institutions needed books for lecturing, images of all kinds to illustrate information, raw material to experiment on and so forth. Usually, these were collections amassed to be used and eventually consumed. In addition, however, universities gathered valuable signs of their own importance such as ceremonial maces and presidential portraits as well as donations of valuable gifts, for example the above-mentioned drinking vessel. Carefully preserved, objects such as the ship were and are outward signs of the long and glorious history of a university. These types of cimelia often live in strong rooms for most of the time. Their importance for and role in the self-definition of institutions, even as an early mark of corporate identity, will be investigated in a conference organised by the University Archives (UAM) of the Ludwig Maximilian University (LMU) in Munich in 2017. This year’s conference, however, explored a range of issues connected with university collections worldwide. The focus was, however, on the collections (once) held at LMU. Munich University moved house twice during its nearly 550-year old history – from Ingolstadt where Emperor Ferdinand received his education to Landshut, and then to Munich – and amassed and lost an impressive amount of collections used for research and teaching during this period. Today, LMU still owns a number of collections pertinent to a range of disciplines. While some may be visited by the interested public, the quality of display is variable and overall one may say with some justification that the collections have held a long beauty sleep and are in many cases still waiting for their prince. There are, of course, historical reasons such as the cultural politics of Bavarian kings, war damage to documentation and collectibles as well as lack of available space and the influence of technical progress in our digital age. Recent innovation, however, also offers new chances for virtual presentations, while a slow process of reconsidering university collections has started to take hold in Germany, in particular under the influence of the Coordination Centre for Scientific University Collections (CCSUC) in Berlin: http://wissenschaftliche-sammlungen.de/en/. In particular, since the Coordination Centre started work in 2012, university collections receive renewed attention and are once more regaining recognition as important tools for teaching and research rather than being seen as an expensive and unnecessary luxury. In the United States, there is a different tradition of dealing with university collections. Historically, collections and departments were developed in tandem. The early generations of professors in disciplines such as art history often had received their training in quite different subjects and were collectors themselves. Therefore, the collections were an essential part of the department and received care, funding and appreciation of a kind almost unheard of in Europe – as so often, the UK is a case apart. In addition, the collections have long played an important role in the education of the student and non-student population. For example in the case of the David Owsley Museum of Art Ball State University (http://cms.bsu.edu/web/museumofart) it was a group of local ladies who founded the Art Students’ League in 1892 and soon started an art collection as well as organising exhibitions. In Europe, where most universities were instituted from above such grass roots initiatives connecting town and gown occurred very rarely. Since historical conditions are not always helpful to the situation of university collections in Germany, it becomes even more important to seek possibilities to save these collections for the future and to find ways how they cannot only be preserved but used for object-based teaching and research. In the natural sciences, the concern with issues of bio-diversity has given rise to a new interest in collections of fauna and flora. In the humanities, there is still some way to go but in the meantime, it is becoming ever more evident that historical collections of plants or archaeological artefacts harbour vital treasures of information ready to be unlocked. In either case, it may not be possible to replenish the collections, while the places of origins are under threat by war or natural catastrophes. One important step forward towards the use and appreciation of these collections lies in the greater visibility of the collectibles. Ways of display, whether digital or in the flesh, draw in visitors from all walks of life. Special exhibitions, concerts, theatrical performances are some of the means to bring the collections alive and catch the attention of a public that, once interested, will wish to know more. At the same time, research projects connected to university collections may find in helpful to present their results to a wider audience and to include issues of museology to their studies in the material culture of their chosen period. 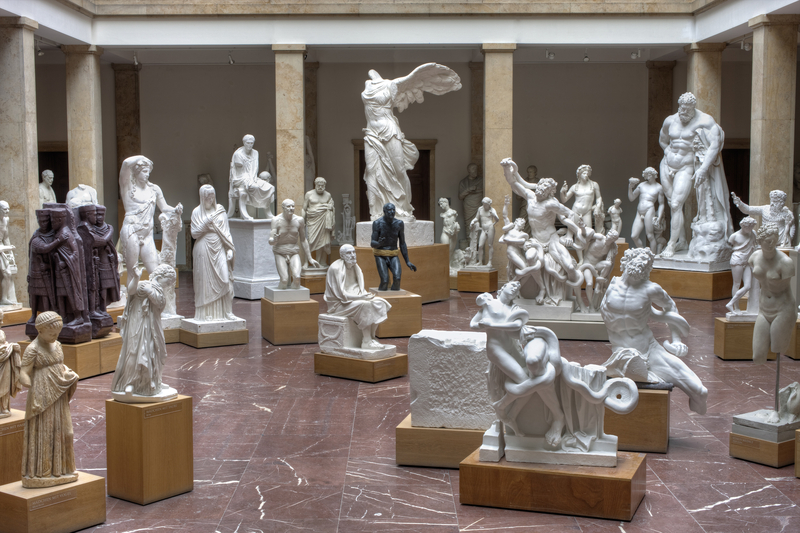 In Munich, for example, the Museum für Abgüsse Klassischer Bildwerke (http://www.abgussmuseum.de/) not only holds a rich collection of plaster casts after ancient buildings and works of art, including objects on permanent loan from the Metropolitan Museum of Art, NY (Fig. 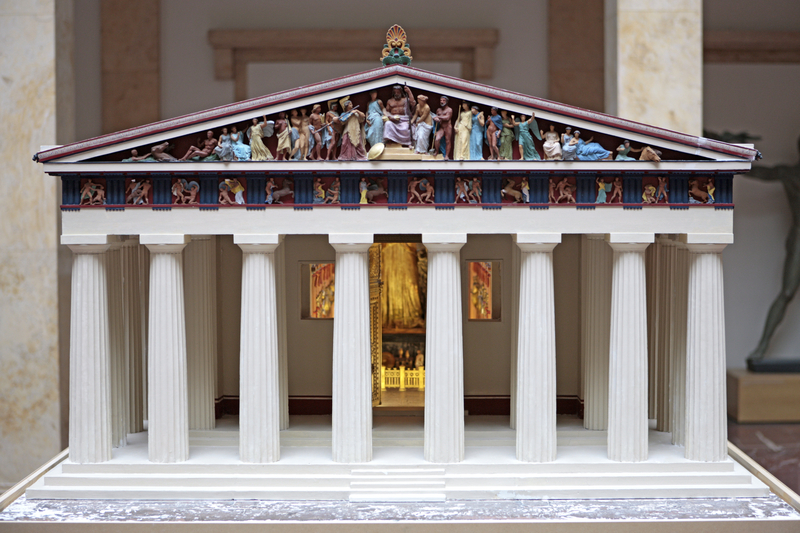 1 Parthenon model), its focus on ancient portraiture or models and reconstructions (Fig. 2 Ingolstadt Ship, & Fig. 3, sculpture plaster casts and Fig. 4 Athena Parthenios reconstruction) makes it the perfect place for teaching on-site. Nonetheless, the Museum’s director Ingeborg Kader also established a cultural programme rich in variety that offers a range of exhibitions, guided tours, concerts and ancient drama performed regularly in the galleries. The same building is located near two of the foremost state museums of ancient art and culture in Bavaria, the Antikensammlung and the Glyptothek (http://www.antike-am-koenigsplatz.mwn.de/en.html). It also houses the Munich Graduate School for Ancient Studies “Distant Worlds” (http://www.mzaw.uni-muenchen.de/dw/index.html) whose research is not only important for the progress of the discipline but directly benefits the display and interaction with the public by means of the collection of plaster casts. Thus, the collection has already made the step towards becoming an exhibition. It is still expanding and through its diverse phases attests to new techniques and a rise in quality as well as to the historical dimension and restorations of earlier times. The students learn about the use of colour, types of portraiture, antiquarianism and acquire a sense of three-dimensional space that is difficult to gain from visiting the ruins of Rome and Athens. In addition, as a project of the Universitätskustodie at the University of Erlangen Nuremberg has recently shown, students may learn from hands-on practice (Figs.). 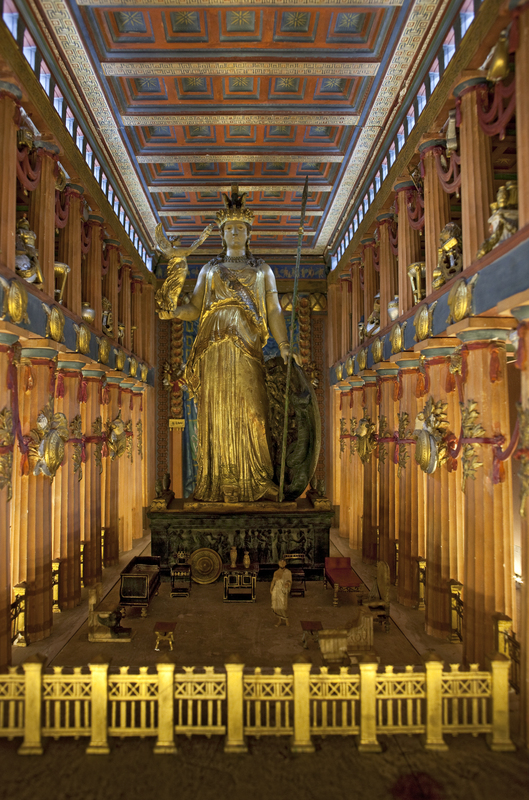 Directed by Martin Boss, they created small-scale models of the temples and basilicas once in the administrative centre of imperial Rome (http://www.antike-am-koenigsplatz.mwn.de/en/ancient-masterpieces/sonderausstellungen/in-the-centre-of-power.html). Thereby, they learned about construction techniques then and now, town-planning and public architecture, and gained a better understanding of the urban setting of one of the most important centres of power of the ancient world and its main players. The University of Erlangen Nuremberg is at the forefront of museological research of university collections in Bavaria (https://www.fau.de/universitaet/das-ist-die-fau/sammlungen-der-fau/), since it is the only university to have a central institution concerned with the preservation, visualisation and usability of collectibles under the direction of Udo Andraschke. While museology and material culture have been studied for considerable time at North American and British universities, this is still a rather new subject to engage the attention of students and academics in Germany. The first chair in Bavaria was instituted at the University of Würzburg a few years ago (http://www.museologie.uni-wuerzburg.de/aktuelles_und_termine/) and has since established itself as an important tool for teaching and research as well as for putting the subject on the map by means of collaborations in Germany and abroad. Meanwhile in Munich, the University Archives have started several projects including a special issue magazine (http://www.km.bayern.de/kunst-und-kultur/magazin-aviso.html) published by the Bavarian ministry for science, education and culture and a guide book to the collections of the University of Munich – past and present (http://www.universitaetsarchiv.uni-muenchen.de/studiotagung/index.html). It is hoped that a series of conferences on particular aspects of the history of the university and its collections will contribute to a renewed commitment to their preservation and future use. Then, the ship donated by a grateful student will indeed sail towards a silver-lined future for university collections.